Photo: Inter Milan’s Stefan De Vrij, left, celebrates after scoring his side’s second goal during the Serie A soccer match between Inter Milan and AC Milan at the Milan San Siro Stadium, Italy, Sunday, March 17, 2019. 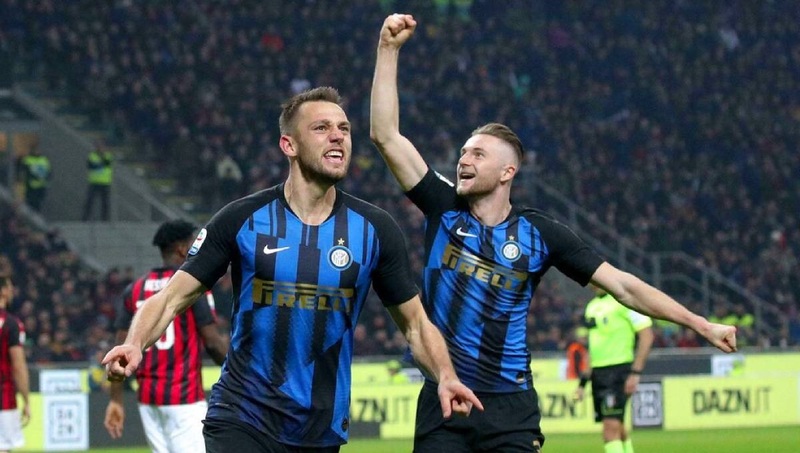 Milan, Mar 18 : Crisis-hit Inter Milan enjoyed a morale-boosting 3-2 win over AC Milan in an entertaining Derby Della Madonnina on Sunday to move back above its city rival in the Serie A standings. Inter moved third, two points above Milan and six ahead of fifth-placed Roma. The top four qualify for next season’s Champions League. The Nerazzurri were eliminated after the group stage of this year’s competition and also went out of the Europa League on Thursday. “Our history is clear, we are Inter so it’s normal for us to be criticized after getting knocked out,” coach Luciano Spalletti said. “We did well to put it straight behind us, showing the right attitude again as a team. “Only crazy people and idiots could have thought that today would be a walk in the park for us,” said Milan coach Gennaro Gattuso. Inter took the lead with less than three minutes on the clock. Lautaro headed down a cross from Ivan Perisic and Vecino was left unmarked to volley the ball into the roof of the net. It was Juve’s first league defeat since April but Massimiliano Allegri’s side still has a commanding advantage at the top of the table.